The problem is that Trados XLIFF (.sdlxliff) files do not actually conform to the XLIFF standard. XLIFF allows you to add new fields to contain information that you are not able to fit into the fields that are defined in the XLIFF standard: this extra information has to be stored in specific ways, so that other software that reads the XLIFF can simply ignore if it is not able to process it. However, Trados stores its extra information in a completely different way and, furthermore, they don't make information about their scheme publicly available. Déjà Vu X2 v8.0.519 appends the text utf-8 to .sdlxliff file headers when exporting. In some cases, the outcome of doing this is that the codepage label in the exported file header, initially utf-8, becomes utf-8utf-8. Trados Studio is unable to parse this construction and thus it can't read the file. Select the file you want to be able to translate in Déjà Vu X2. Here, Trados will automatically detect the language of the existing segments (Italian, marked as auto-detected in the example above), and you can choose the language you want to assign to the target segments (German, offered as optional in the example above). Trados will process the file and add the language. Access the menu option File>Save As. Enter a name for the new bi-lingual file you will create. 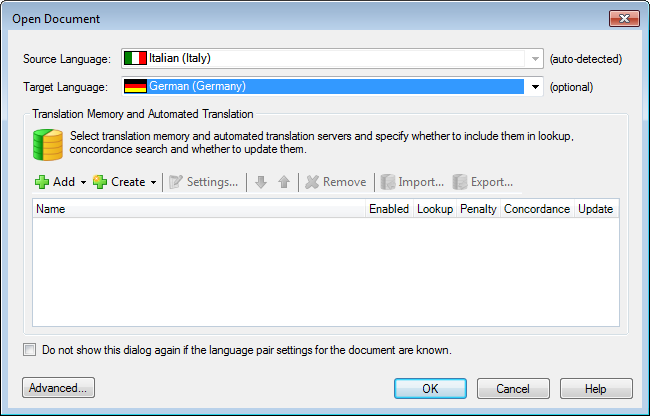 You now have a bilingual .sdlxliff file that can be translated in Déjà Vu X2 and then used again in Trados Studio.